It's time to get your skates on if you want to spend time this summer in your perfect country cottage or dream dream holiday home by the beach. Read on for an A-Z list of some of our favourite country cottages and seaside boltholes, and dream about a repeat of last year's summer temperatures. But don't dream for too long... availability at these wonderful holiday cottages is disappearing fast! Just 40 miles south of Edinburgh, this luxury Scottish Borders bolthole is a stunning place to stay – a sixteenth-century fortified tower sited on a hill amidst some spectacular scenery. Formerly the home of the Liberal politician Lord Steel, it has historic charm in abundance, but you also get all the bells and whistles as far as a luxurious stay is concerned. This amazing, contemporary Cornish holiday home has expansive sea views and access to its own secluded beach at Wanson Mouth – and is also just a short walk from Widemouth Bay, with access to pubs and cafés as well as miles of beautiful sandy beaches and surf spots. With six large bedrooms, it's ideal for big groups. This amazing hand-built wooden barn high on a hill in Herefordshire is a delectable country escape perfect both for couples looking for a secluded bolthole or outdoorsy families after easy access to the Great Outdoors. There's a fabulous foodie pub in the village, too. Two beautifully furnished and equipped romantic cottages – in a glorious Peak District location – that boast handmade furniture and a couple of hot tubs. A five-acre smallholding handily tucked into the heart of the Loch Lomond and Trossachs National Park, these two eco-friendly cottages are open, airy spaces bathed in light, and proof that a low-carbon footprint and a responsible attitude to the environment doesn't mean sacrificing comfort or style. Whether you're looking for a romantic haven or an idyllic family retreat, you've really hit the jackpot at this gorgeous collection of luxury self-catering cottage apartments, tucked into a quiet Devon valley near the River Dart, which come with grass tennis court, croquet lawn, gym and games room... even a piano for anyone so inclined. A super stylish 18th-century Georgian farmhouse tucked away in the heart of Somerset, that’s been gorgeously restored and renovated. It also enjoys a superbly tranquil location, yet is juts a few minutes' walk form an excellent local pub! This traditional Welsh farmhouse, surrounded by glorious countryside, right on the edge of the Snowdonia National Park, was named as one of the '50 Coolest Cottages in the UK' by the Sunday Times, and it's easy to see why. A lovingly restored and furnished cottage, in a beautiful location. This wonderfulGeorgian house is in the heart of a pretty North Norfolk Coast village, a stone's throw from a long sandy strip of beach, and has no less than 7 spacious bedrooms, a massive kitchen and games room and a gorgeous garden with a bubbling hot tub. A long sweeping driveway leads to this grand farmhouse and group of homely self-catering cottages, located on a working farm in the heart of rural West Dorset. There are also two Shepherd's Hut if you're after a glamping experience. Situated in the heart of Borrowdale, this provides a perfect place to get away from it all in one of the most dramatic and yet accessible parts of the Lake District. With a prime location right on the beach in Whitstable, just a short stagger from the Old Neptune pub, One Wavecrest is the ideal place from which to enjoy the town's many attractions. 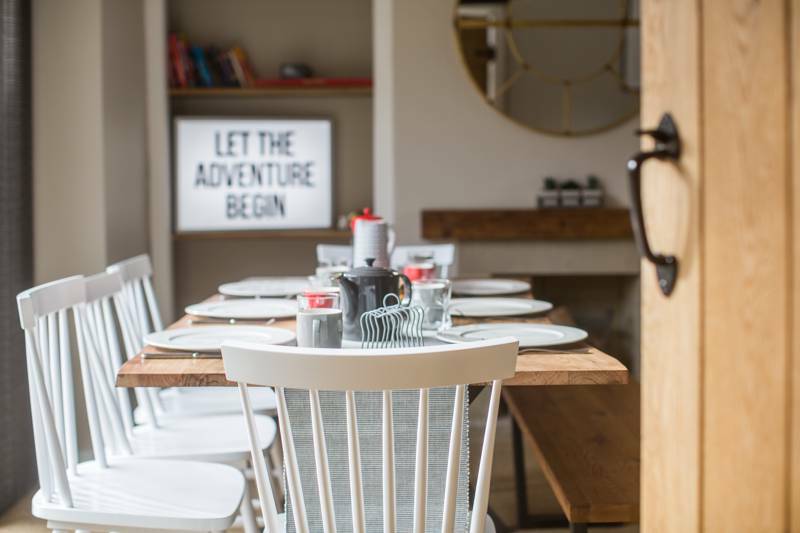 Just over 100 steps away from the lovely Old Stocks Inn in Stow-on-the-Wold, this is the pub's Grade II listed cottage, recently refurbished as a perfect place for a family holiday – traditional yet luxurious, both spacious and cosy. The stuff of rural escape-to-the-country fantasies, hidden down a long remote track, overlooking a breathtaking private forest. You almost expect to see a charming little woodcutter's cottage but instead it's a large, contemporary, stylish converted barn with stone walls, beams and huge panoramic windows. These four properties have been individually converted and designed by Jill Stein, ex-wife of the famous restaurateur, and make a fabulous and very comfortable place to stay, just a few minutes' walk from Trevone village and its wonderful beaches. Enticing cottages and stylish eco-cabins on a working organic farm, in a beautiful hilltop location just a 15-minute drive from the sea. This converted historic corn mill towers over the rural fields of Suffolk, a stunning conversion with furniture that has been curved to follow the contours of the building. Its two bedrooms, kitchen diner and stunning top-floor sitting room make it a quirky and very contemporary place to stay.